Wi-fi, T.v. cable, bedding, towels, cleaning 1 time per week (every 7 days), A fenced parking place. We have restaurant service "Spuntino Los Gabrieles" with snacks, salads and pastas, with hours from 4:00 pm to 10:00 pm from Tuesday to Sunday. Area of 30 m2, clean, comfortable and quiet. Important observation for elderly people: the study is on the second floor and the access is on a slightly narrow staircase. 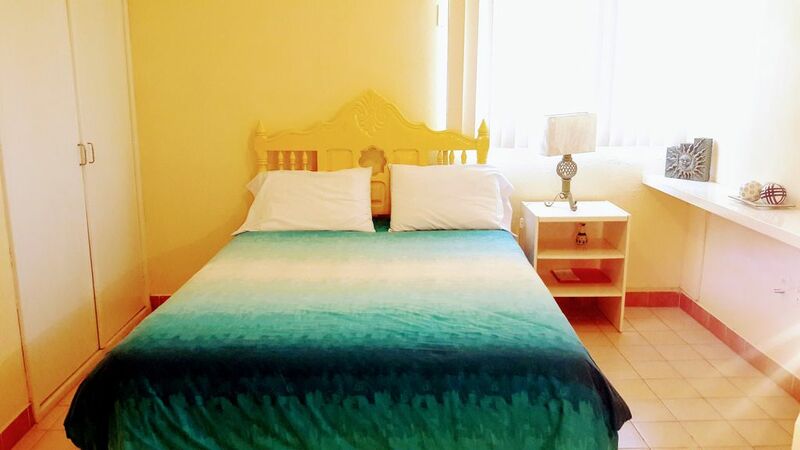 It is a nice simple apartment but it does not stop being cozy, which is in very good location 5 blocks from the boardwalk of the city of La Paz, we continually make improvements for our guests to feel comfortable, has capacity for 1 or 2 ideal for couples, the neighborhood is quiet with little vehicular traffic. We have restaurant service "Spuntino los Gabrieles" open from 4:00 a.m. where you can enjoy snacks, salads and pastas. If you have a car we have fenced parking and very safe. In Departamentos Varmen we will love to attend and be part of your adventure in this beautiful place in Mexico. The studio is very well located 5 blocks from the boardwalk but it is still in a quiet street with little traffic flow, it is a very touristy neighborhood. We are 3 blocks from a very good size supermarket called Chedraui and in the vicinity there are different shops such as restaurants, cafes, mini supermarkets, marinas, etc. The transport in the city of La Paz is not very efficient, the most convenient is to rent a car but if you like to walk there is no problem because the location of the apartment is very good, the location of the apartment is easy to reach the center and to go to the most distant beaches in the truck terminal that is on the "Transportes Águila" waterfront, there are trucks that take you to the most remote beaches such as "el Coromuel, Balandra, Tecolote".